This bulletin board will not only look great for preschool graduation but will also give your students extra math practice, preparing them for Kindergarten. The teacher will cover the bulletin board with blue paper. Any color of border can be used. She will place black block letters on the top to spell out the words "Leaping Into Kindergarten." 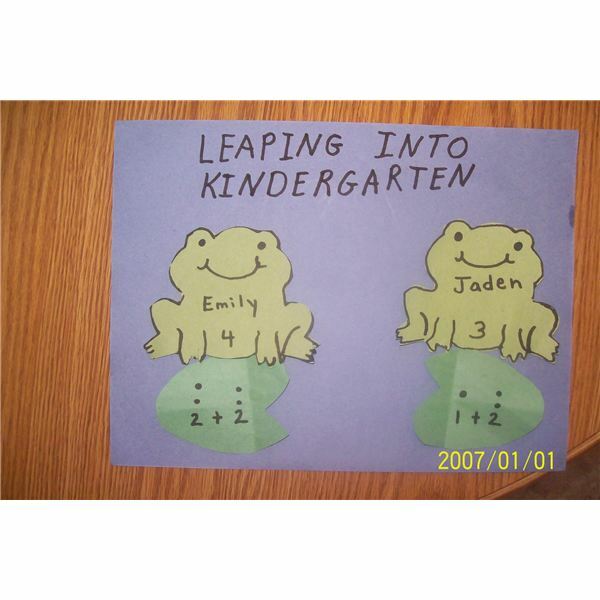 She will then cut out a green frog for each student and place the student's name, and a number one through ten on the frog. The teacher will cut out several lily pads from green paper and put an addition problem on each one with the numbers and corresponding dots. The lily pads will be placed on the board, the teacher will call a child's name to come and get the frog with their name and number on it. The student will read the number and match the sum to the correct lily pad. He will stick the frog on the lily pad with glue or sticky puddy. The teacher may wish to add flowers or additional decorations. Kids will love making this bulletin board to celebrate graduation. 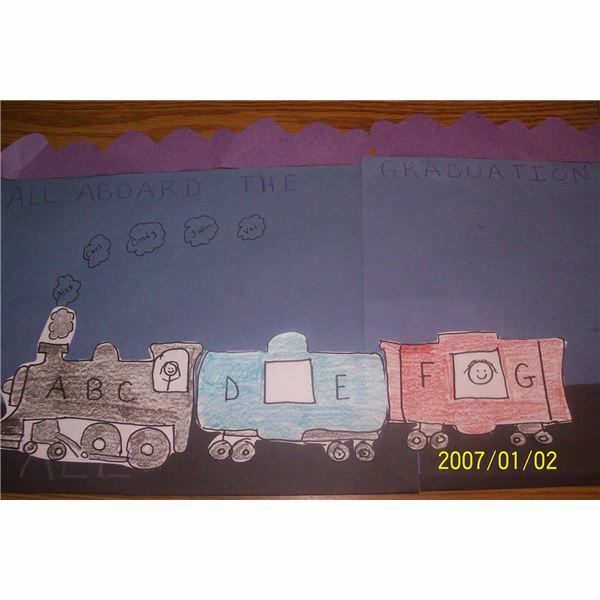 The teacher will line the bulletin board background with blue paper, place black on the bottom (for train tracks) and put any color border around the board. She will title the board with purple block letters "All Aboard The Graduation Express." The teacher will then color the engine and place her photo in the window. Students will color the cars and place their pictures in the windows. One lucky person will get to be the caboose. The teacher will give each child a smoke cut out and they will write their names on them. The teacher will put them on the bulletin board. This preschool bulletin board will keep students on the right track. There are several different ideas that could be used for an end-of-the-year theme. What a better way for teachers to make the end of the year a fun, rewarding experience for the entire classroom than with these preschool bulletin board graduation decoration ideas that will engage students in a hands on learning experience. Teachers could cut out a space station with windows displaying the student's faces. Children could decorate the station, and create stars, the moon, and planets to place onto the board. Children could be aliens instead of astronauts with the title being "Landing on Foreign Land." These are several ways children can create a terrific end of the year bulletin board.